Brenda Tetreault. Prophecies and Destinies. Baltimore: PublishAmerica, 2012. In this, the concluding installment in the Bounty Cove Chronicles, all the couples we have come to know in the previous five novels must work together to defeat the evil that has been feeding on their kind for aeons. At fifteen years old, Lily Sullivan is nothing but trouble. The feisty red-headed teenager’s obsession with her good-for-nothing boyfriend Trevor finally causes her father to take action–he sends her to live with her Aunt Tess in the small town of Bounty Cove, North Carolina. Within a year, Lily has forgotten Trevor and fallen in love with Colby, a quiet local boy who doesn’t push or pressure her. But then Colby moves away. He promises he’ll be back for her, and Lily believes him, but it still breaks her heart. Twenty years later, a man collapses on her doorstep– it’s Colby, finally able to return to the one woman he never stopped thinking about. Now that they’re back together, nothing can stand in the way of their love. Or so they think. 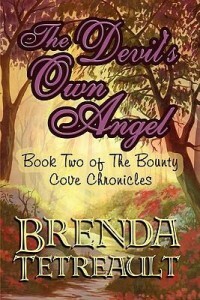 A dangerous evil that has been haunting Bounty Cove for ages is rising, and Colby is its target. Bounty Cove has always been a strange crossroads between what regular humans believe in and what actually exists. Until now, no one has been able to explain why; those affected have simply had to accept the strangeness of their abilities, or those of their significant other, and move on. Now, everything is going to become horrifyingly clear and it’s not only Colby and Lily who are in danger, but all of Bounty Cove. Will Colby, Lily, Devil, Angeline, Natali, Britt, and the others be able to stop the malevolent force seeking to destroy their lives after they have worked so hard for peace? Check out the final reckoning in the UNC-Chapel Hill Library catalog. Brenda Tetreault. A Ghost of a Chance. Baltimore, MD: PublishAmerica, 2011. 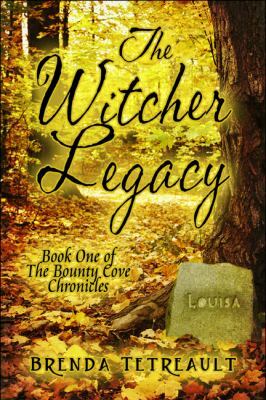 In this fifth installment in the Bounty Cove Chronicles, the reader follows the story of Kate Morgan, who comes to Bounty Cove to escape her misery but ends up staying for love. Three years ago, Kate’s fiance Tucker was murdered on the morning of their wedding. His ghost, pulled back to earth by the depth of Kate’s despair over his death, is determined not to leave until his former fiancée can find true love once again. Unfortunately for the grieving Kate, having Tucker’s ghost around isn’t helping her to move on. Five years after that finds Kate in small town Bounty Cove, North Carolina, seeking peace with her new life. It is no longer so painful to speak with Tucker’s ghost on a daily basis, even though his insistence that she find love again drives her crazy. Then, in a chance moment in the local bakery, Kate meets Wil Montgomery, and her world turns upside-down. Handsome Wil, a famous movie-star who decided to leave the glitzy facade of Hollywood life, has returned home to Bounty Cove where he grew up, looking for some peace. He didn’t intend to fall for someone, but he can’t help loving Kate. But he has baggage of his own, and those dark events are haunting him…literally. Like Kate, he has a benign ghostly companion hoping to see that he moves on and enjoys life. But will the couple be able to dismiss their troubled pasts so easily? Love makes all things possible, especially in Bounty Cove. Brenda Tetreault. Shadow of Doubt. Baltimore, MD: Publish America, 2011. Natali Sinclair still hasn’t recovered from the dark power that threatened her twin sister, Molly, a few months ago. Although Molly survived and recovered completely, Natali’s deep connection to her twin sister, combined with the mental anguish of the situation, released power lying dormant in the young woman’s mind. A natural empath (someone with the ability to both feel and influence others’ emotions), Natali’s experience with her twin released her own power to its full potential–and now it’s hurting her. Luckily, someone else is similarly blessed (or cursed). Britt Darbonne, a friend of Molly’s husband, is also a powerful empath. Over the years, he has learned to control this ability so that the emotions of others don’t hurt him, and he doesn’t unduly influence everyone around him. Britt would be attracted to the dark, vibrant Natali even without her gifts, and she’s equally attracted to him. But living with another empath is difficult, and it doesn’t help that Britt has a dark past that haunts his relationship with Natali. Will Britt and Natali find a way to control her powers, and finally be happy? 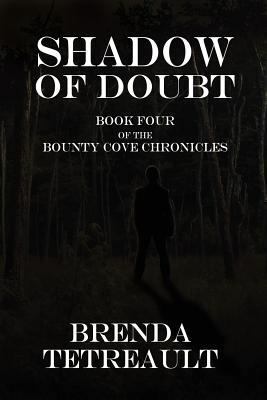 It looks possible, but when a vengeful spirit finds its way into their midst, Bounty Cove is once more the site of a frightening supernatural conflict. This is the fourth installment in the Bounty Cove Chronicles, a series of paranormal/supernatural romances meant for readers age 18 and up. Brenda Tetreault. 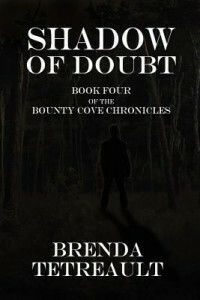 The Bounty Cove Chronicles. The Witcher Legacy. Baltimore, MD: PublishAmerica, 2009. The Devil’s Own Angel. Baltimore, MD: PublishAmerica, 2010. Then, Now, Forever. Baltimore, MD: PublishAmerica, 2011. Shadow of Doubt. Baltimore, MD: PublishAmerica, 2011. 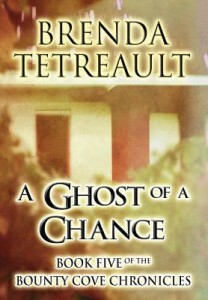 A Ghost of a Chance. Baltimore, MD: PublishAmerica, 2011. Prophecies and Destinies. Baltimore, MD: PublishAmerica, 2012. Bounty Cove is a small (fictional) town on the North Carolina coast. Like many other towns along the Outer Banks, it’s full of kind, proud people whose families have called this bit of shore home for generations. But unlike other towns, Bounty Cove is also a locus of unexplained phenomena and paranormal activity. 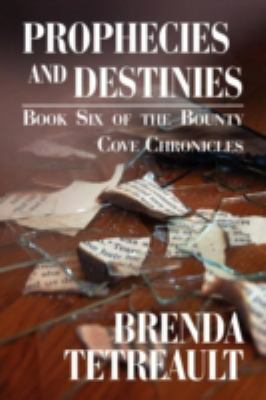 Ghosts, mind control, reincarnation– it’s all in a day’s work for the residents of Bounty Cove. A series of paranormal romances designed for an audience over the age of 18, each novel begins when a girl meets a boy, but after that, readers should abandon all their assumptions regarding traditional courtship. Supernatural forces work to keep the couples apart, and to destroy their lives and families. Is love enough to prevail when someone’s demons don’t exist only in his or her mind, but in the physical world? There is plenty of mutual attraction between each couple featured, but the series does remind readers that an invisible problem can separate two people in love. In Bounty Cove, the problem just happens to be supernatural in nature more often than not! 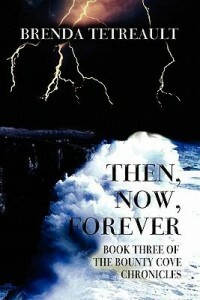 While each book features a different love story, many characters reappear across the series. By the end of the Chronicles, readers might feel as though they themselves live in Bounty Cove, although hopefully without the vengeful spirits. Brenda Tetreault. Then, Now, Forever. Baltimore, MD: PublishAmerica, 2011. Molly Sinclair has shut herself away from human connection over the last six years. She has her twin sister Natali and her five-year-old son, Jack– so far, those relationships have met her needs. But when Chance Younger walks through the door of her flower shop one day, Molly finds herself unexpectedly caught up in a whirlwind romance that not only been destined…it’s already happened once before. Chance Younger can’t explain why he’s immediately, viscerally attracted to the young, hazel-eyed florist. He’s only in Bounty Cove for a short time to visit his cousin Nick “Devil” Damien and his family, but Molly Sinclair makes him want to stay much longer. Molly makes it clear she isn’t interested in a short-term relationship, but after one evening together, Chase feels like he has no choice but to leave– although in the process of divorce, he’s technically still married to his mean-tempered wife, making any relationship with Molly impossible. Still, he’s drawn back, as is Molly, by this inexplicable feeling that they’ve known one another before. Unfortunately, both admit that they have a terrible feeling that their past relationship, while passionate, was not a happy one, and ended in blood. Were they married in a past life? And more importantly, is it possible to change the pattern, and live happily ever after? 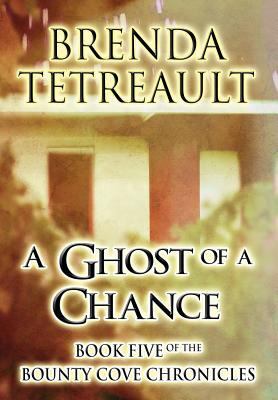 While the first book of the Bounty Cove Chronicles focused on ghosts and the second gave us a glimpse of life with a hyperempathetic individual, this third paranormal romance from Brenda Tetreault delves into the world of reincarnation and past lives. Are we all just living the same pain over and over again? And can we ever change? 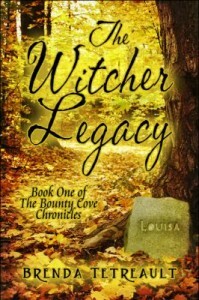 Check this title’s availability in the UNC-Chapel Hill Library catalog, where you can also find the first two novels in the series, The Witcher Legacy and The Devil’s Own Angel.